A Lean Beer or Lean Coffee is a meeting structured without an agenda. Discussion topics are chosen democratically by the attendees, at the start of the meeting, via a vote. 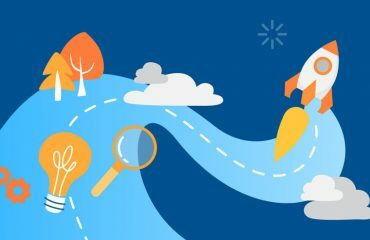 Lean meetings are common in tech and agile circles, but the Lean format can be applied to any meeting, anywhere. A Lean Beer just means it takes place while enjoying beer, whereas a Lean Coffee takes place over coffee. 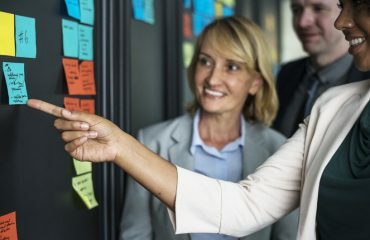 Who Created the Lean Beer & Lean Coffee Concept? The Lean Coffee meeting style was created by Jim Benson and Jeremy Lightsmith in 2009. It was their way of removing all the logistical headaches associated with meetings – organizing a venue, creating an agenda, finding presenters and so on. 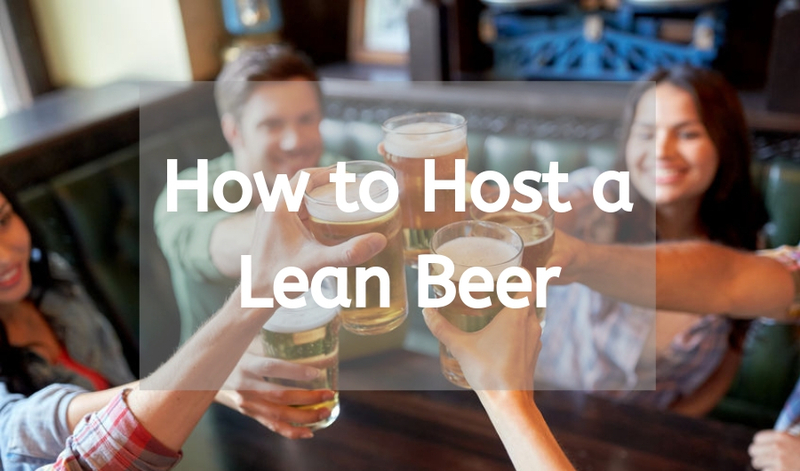 Lean Beer is a twist on Lean Coffee for those who prefer beer over coffee. Or those who find after-work more convenient than early morning. Sounds like the complete opposite of best practice for meetings in the modern world, right? 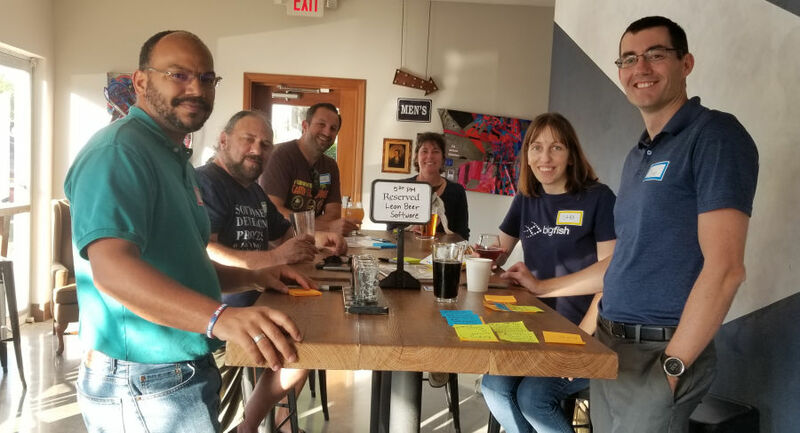 Well read on to find out why a Lean Coffee is effective, and how to host one in your city. 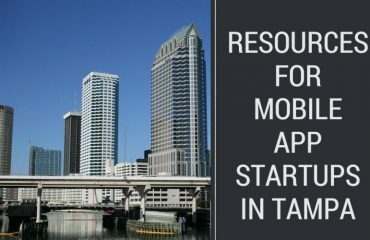 Where Lean Coffee is typically held at a coffee shop early in the morning (in Tampa/St. Petersburg they happen at 7:30am) a Lean Beer is a great after-work alternative. 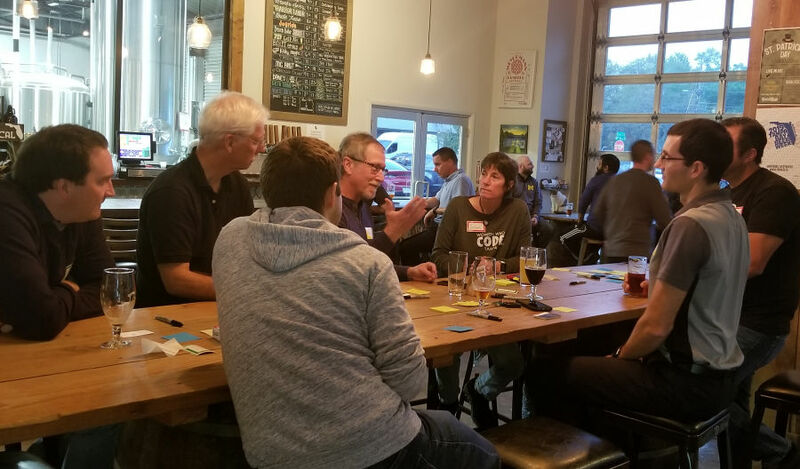 There is no charge to attend a Lean Beer, but participants purchase their own drinks. To keep things moving quickly and avoid distractions it’s ideal to not have food involved. Here at Big Fish we host a Lean Beer every month. They take place at craft breweries around the county and stimulate really great discussions! Software Craftsmanship is the theme of our Lean Beer meetup. It’s a topic personal to us and we want to encourage discussion about it. We use Meetup.com for posting our event schedule and receiving RSVPs. Meetup.com is a great platform for this as it comes with an audience built-in and has all the features we need. Here is the structure we use. I go into more detail later in this post. One of the great things about the Lean meeting style is that they are very easy to organize. I bring name tags, Post-its and Sharpies. That’s it. I recommend ten or less in order to encourage a good conversation where everyone is involved and can sit close enough together to hear each other. I like the feel of a conversation among friends that this creates. If more than ten people show up you can split into smaller groups. Each of the below ‘phases’ is time blocked to ensure you start and finish the meeting on time. Be sure you have someone in charge to ensure the structure and time limits are maintained. 1. Introductions – We invite everyone to give a quick introduction – your name and what you do that has you interested in attending. 2. Suggest Discussion Topics – Next we distribute pads of Post-it notes and Sharpies around the table. Everyone has a few minutes to write out topics they want to discuss. Sharpies make it easy for everyone to read those Post-its as they are about to be stuck to a wall. 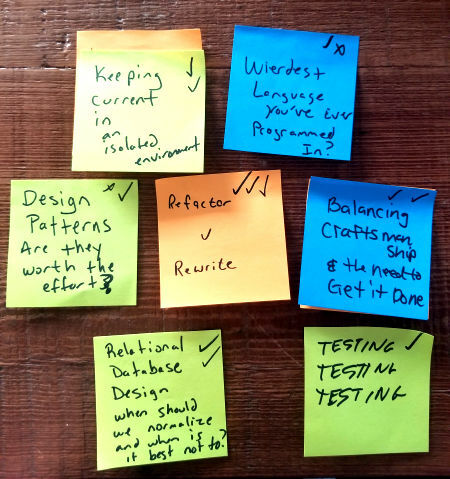 One topic per Post-it, suggest as many topics as you like. When done, have everyone affix their post-its to a window or solid surface. 3. Questions – Questions will definitely arise as everyone reads the topics. You can either give each person 15 seconds to explain/sell their topic before you vote, or let the group answer questions as they come up. We find it more efficient to just let people ask questions as they come up if a topic needs more explanation than what could fit on the Post-it. 4. Vote – Each participant gets three votes. 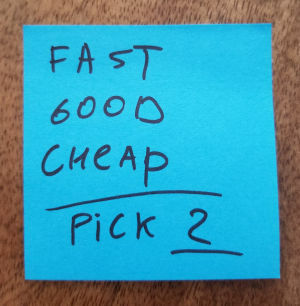 Votes are cast by placing a check mark or asterisk on the Post-it containing the topic you want to discuss. You can also distribute tiny circle stickers. But casting vote by pen makes one less thing the organizer needs to bring or prepare. 5. Tally the Votes – The topic Post-its are then arranged in a column based on vote count. If you like you can do this Kanban style with 3 columns: To Discuss, Discussing and Done. 6. Choose the Time Limit – Before getting started, take a vote on how much time will be spent discussing each topic. Five minutes is common. Choose a person to keep time on their smartphone and notify the group when five minutes is up. 7. Discussion – Ask the person who created the topic to kick-start the conversation, then let it flow naturally. When time is up the timer will call out and take a quick “thumbs up or thumbs down” vote on whether the group wants to stay on that topic for another five minutes. If yes, you keep talking, if no you move on to the next topic. 8. Wrapping Up – The discussion continues until you run out of topics or run out of time. You may notice people start to lose steam after 45 to 60 minutes of discussion. As you can see, a Lean Coffee or Lean Beer is far from an anything goes, disorganized mess. It’s a refreshing change of pace for attendees as they get to directly impact the discussion topics. And, because all topics are determined by vote, you ensure that those topics discussed matter to the people attending. Truly these are so much fun. Pick a theme you’re passionate about and host one in your city.